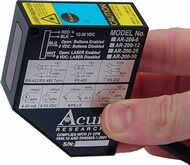 The AR200 group of laser measurement sensors is Acuity’s most compact series of triangulating laser displacement sensors. Four models cover metric measurement ranges from six to fifty millimeters. These laser measuring devices aim a Class 2 visible laser spot onto your target to accurately gauge its distance. Designed to withstand difficult industrial environments, the AR200 laser sensors are commonly used in forest products, medical and high tech industries. The AR200-6M, -12M, -25M, -50M and -100M have ranges in millimeters that match their model number. All models boast a 0.03% resolution across their entire measurement span. All models are standard with Analog, Limit Switch and Serial outputs. The AR200 sensor is the only sensor of its kind to feature pushbutton selection of these output signals. Additionally, these laser sensors can be programmed using serial commands through a PC computer.